The sculpture of Casiano Dabalos Gerona is now installed in the City of Tabuelan. The statue measures 150 cm from the head down to the feets and sits on a mounument made of Mactan stones. 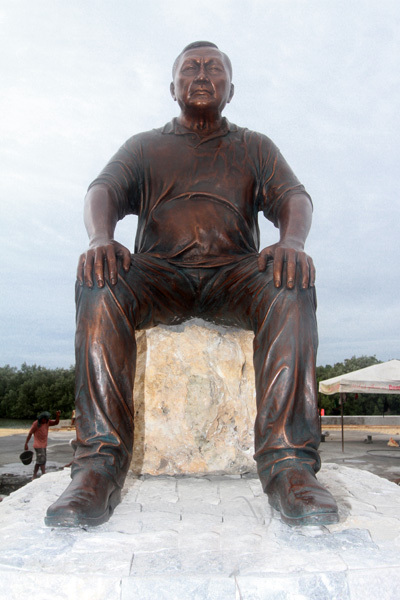 Mayor Rex Casiano Gerona who is developing the place around the bus terminal of Tabuelan as a tourist destination, and the City are honoring the work of his father, Casiano Dabalos Gerona, by placing this sculpture into the heart of Tabuelan. It is a very lifely statue rich in details and actually casted in fiber glas. The statue is coated with plenty of colored layers which give it the look of a classic bronze sculpture.